Buckeyes with Bourbon and Toasted Pecans Inside For A Surprise! This new twist on traditional buckeyes has them robed in dark chocolate, kissed with bourbon, and stuffed with a buttery, toasted pecan! Getting a bit personal here. 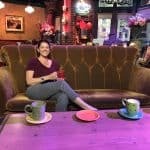 I want to share a little bit of my past with you that I am not proud of, but I feel that you should know anyway. I didn’t eat peanut butter cups for 12 years. The reason I gave up those delicious, creamy, satisfyingly perfect treats comes down to one unfortunate day in 11th-grade Physics class. I used to fall asleep in Physics class all the time, not because it was boring for a science-loving nerd like me, but because it fell right in the middle of the morning. For someone who didn’t eat a great breakfast, Pop-Tarts anyone, I usually had my sugar crash about this time and it was two more periods before I was allowed to eat a disgusting school lunch. It also didn’t help that the teacher had a voice that could make an empty desk fall asleep. One tired morning, while the teacher was going on and on about waves and sounds, I was on the verge of drooling on my desk when I looked down and saw a package of Reese’s PB Cups. As a band geek/color guard twirler, I was forced to sell candy and other various foodstuffs to raise money. I had said box of foodstuffs at my feet! One box of unsold, PB cups, that were sending out “eat me now” messages through frequencies that no one else could here except me. I decided to eat one package, thinking that maybe that would bring me out of my catatonic state. I ate it, both cups, and instantly felt better. My hunger sensors kicked in when they received that first message that chocolate and PB were nearby. What’s one more package? It would be like an appetizer and keep me awake during Shakespeare narration in the next class. Who doesn’t need that? Trigonometry class is pretty boring to me too, so let’s have another package for good measure… 12 packages later, that’s 24 PB cups for those making little tally marks in their head, and I was ready to get up and do something. I was teetering between running a marathon or puking my guts out. I managed to keep those sugar bombs down, but was wired to the gills! I think I marched faster than anyone in band practice that day and didn’t sleep at all that night. After that day, I couldn’t even look at another PB cup for a while. I also had to cough up the money for the 12 packages I ate and didn’t sell. BOO! Fast forward 12 years and my first taste of PB cups after the drought. I am in “like” again! I still can’t eat more than 1 cup at a time but we are at least on speaking terms again. Can’t say that for the Big Mac, but that is another story for another day. The best way to eat chocolate and peanut butter, besides a PB cup? A Buckeye! It’s bigger, the ratio of PB to chocolate is much higher so it’s “healthier” to eat, and they don’t come in a wrapper that gets in your way of eating them! No need to waste time unwrapping and peeling back fluted cup wrappers that steal a small, thin layer of chocolate from the bottom of your cup and a piece of your soul at the same time. 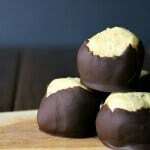 I have only made buckeyes one other time and loved them of course, so I thought I might shake things up this time. Let’s throw in some booze, use dark chocolate, and add a yummy surprise to the middle of them. Who doesn’t love a surprise in their mouth? The surprise in the middle? A buttery, salted, toasted pecan! The saltiness cuts through the sweetness of the peanut butter mixture. The dark chocolate helps to keep it in balance. It also doesn’t hurt that there is some bourbon in there too! Adults only, please. These are not cooked so all the alcohol is still present. It’s not as overpowering as a rum ball but you can still smell it. I have a recipe for rum balls that my brother Brian makes that will get you drunk just pulling into his driveway. I eat a lot of those at Christmas:) That recipe might make an appearance this season. 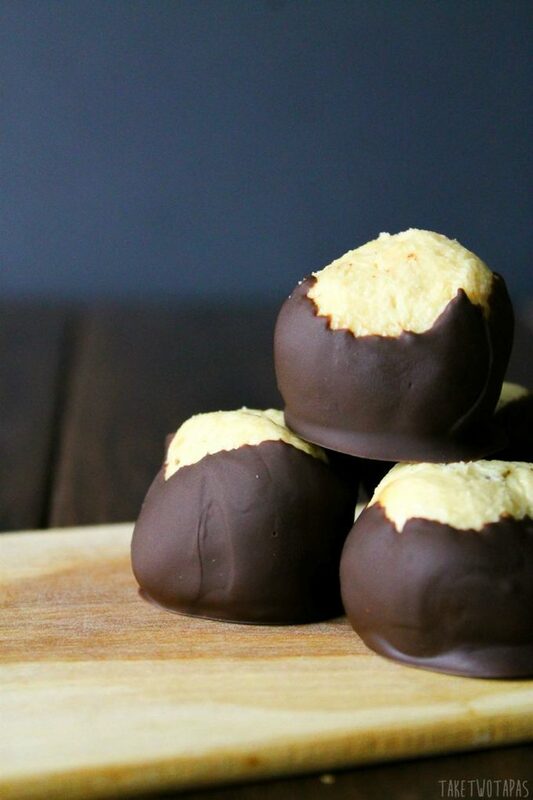 These Bourbon Buckeyes are easy to make and fun to take to a party. Not too many people dislike the chocolate and peanut butter combo, unless you slip and have a tragic PB cup hoovering incident that might land you in PB cup addicts support group, so take a tray! How many can you eat at one time? Classic Buckeyes are given a makeover with some dark chocolate, a hint of bourbon in the mix, and a salted, toasted pecan in the middle to make Bourbon Buckeyes! Combine the peanut butter, butter, salt, and vanilla in a mixing bowl until fully incorporated. When mixed in, add the bourbon. 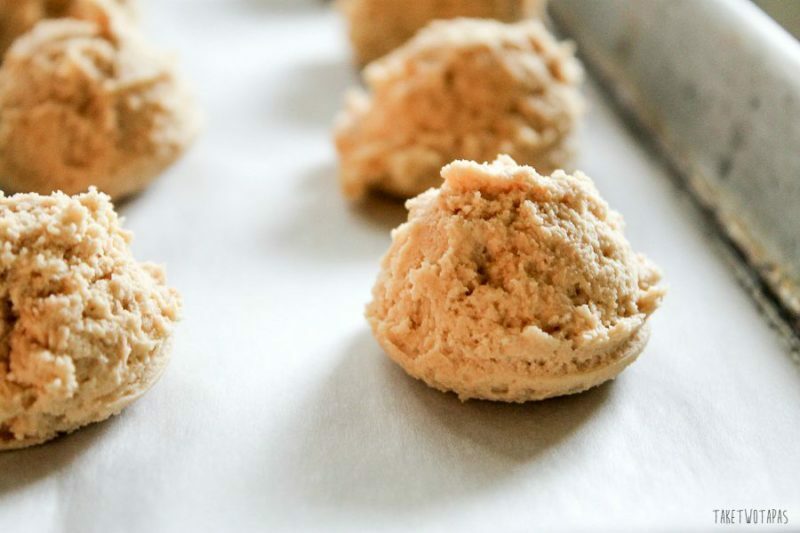 Scoop into 1 inch balls (I use a mini ice cream scoop) and place on a parchment-lined baking sheet. Remove and add a pecan half to the ball. I push the pecan in slightly and then roll the ball in the palm of my hand. The peanut butter will naturally move over the pecan and cover it. Freeze balls for 30 minutes. While the peanut butter balls are chilling, melt your chocolate chips. I added my chocolate wafers and oil to a small metal bowl set on a pan of simmering water (double boiler method) but you can melt yours in a microwave at 30-second bursts. When the balls are set, insert a toothpick (not deep because of the pecan hidden inside) and dip in chocolate. Return the dipped balls to the lined baking sheet and put back into the freezer or refrigerator until chocolate is set. Remove toothpick and smooth over the hole with a slightly wet finger. Keep stored in the refrigerator until ready to serve. Enjoy 1 week if they last that long. These look good and I plan to make them this week. What I really want to know is, did you ever post the recipe for your brother’s rum balls? I would like to make both! Please shoot me a picture when you make them! I am posting the rum ball recipe on Saturday but I can shoot you the recipe in an email if you need it beforehand. Let me know! I can’t decide what I love more? Your stories or your recipes!! LOL!!! I have never made buckeyes, but I know I will now!! I love the idea of adding pecans! These look so delicious! You crack me up… only because I have a love hate relationship with certain candies and cookies for similar reasons as you! Lucky for me I still LOVE PB cups and I will definitely be giving this a try! Oh my gosh, Jenn, I can just feel how awful you felt after eating all those PB cups. Not to mention you had to pay for all of those overpriced goodies! I’m glad you’ve made peace and added bourbon buckeyes back in you life. We’re all happy now. These babies are divine! I enjoyed reading your story; have definitely been there myself at one time or another! 😉 And from here on out I can only ever eat buckeyes with those surprise nuts inside! Pure genius!!! I have a similar story that I kept a bag of miniatures in my desk for a snack. Well, once I opened the bag that was all it took. I ate the whole thing. Unfortunately, I didn’t get ill and would have eaten another one had I had it. I never did that again. I love your Buckeyes and would devour about a dozen of them without looking back too! What I wouldn’t give for such a surprise every day! Plus I love pecan, so it’s epic win for me! Thanks Levan! I love surprising people with food! 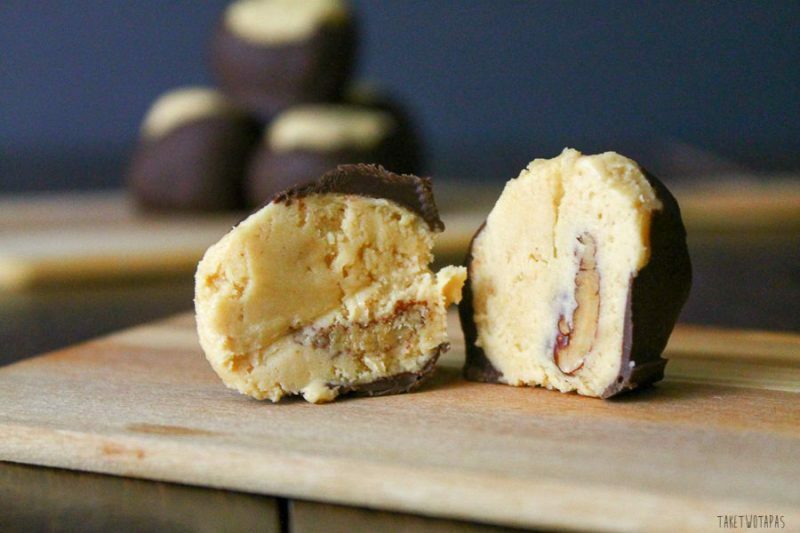 Yum – peanut butter and dark chocolate, two of my favorite things! I bet the bourbon makes them even better!! I think the bourbon makes them a little grown up so I don’t feel bad about eating “candy” like a kid! These look incredible delicious. Although I do eat (too many) Reese’s peanut butter cups, I’ve never gorged on them. Still, I could easily give them up for these little treasures. Thanks! I definitely regretted eating so many but I did love them, so it was hard to stop! For sure! You have to have some balance! Thanks for reading Heather! I thought the bourbon was the surprise 🙂 Love the pecan addition – such a good idea! Thanks! I love to add some texture~! Jennifer these look FANTASTIC !! I love these little guys! The pecan is a great touch but I have to say the bourbon surprised me more 😉 In a very good way. Looking forward to trying these. Also? You and I would have been good friends in high school. Most definitely we would have been friends! Bourbon is an everyday thing in this house!